This outfit combines two of my favorite trends: neon and stripes. One of my go-to outfits when I’m feeling uninspired is a high waist skirt, belt and a simple tee. A lot of skirts come with belts but I almost never wear them together. Don’t be afraid to add your own belt, it gives the look your own personal touch. I love that this tee has a washed out neon look but still brightens up whatever I pair it with. You’re too cute for words….the skirt is love!! Love the skirt! Great color combo! You are just too cute, I love that striped skirt! This look is really cute! You have killer legs and they look great in that skirt and those shoes!!! SUCH a cute skirt! I can never find anything that nice when I go to F21. It’s always a hit or miss for me. Love the stripes on that skirt. Pairing it with pink is great. Black, pink and white go so well together! It’s a perfect summer look, very cute and comfy! Love the wedgies! love your blog — I’m your newest follower! such a gorgeous outfit I love the skirt! I love the striped skirt! It looks perfect with the neon top & wide belt! Oooh i love the top! i like how you matched it with the skirt, so cute! SO CUTE!! 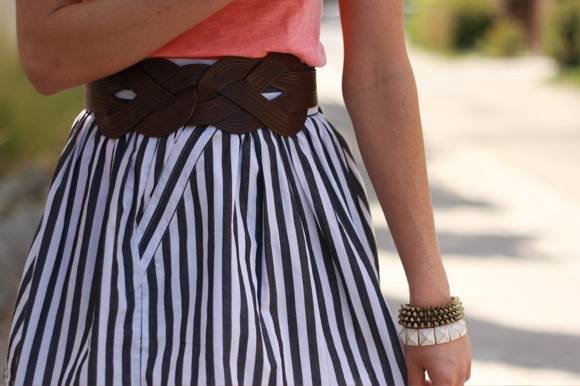 love that striped skirt! !